Match ends, Portland Thorns 3, Houston Dash 0. Second Half ends, Portland Thorns 3, Houston Dash 0. Amber Brooks (Houston Dash) wins a free kick in the attacking half. Goal! Portland Thorns 3, Houston Dash 0. Christine Sinclair (Portland Thorns) right footed shot from the centre of the box to the centre of the goal following a set piece situation. Attempt missed. Rebecca Moros (Houston Dash) right footed shot from outside the box is high and wide to the left. Attempt blocked. Carli Lloyd (Houston Dash) right footed shot from a difficult angle on the right is blocked. Substitution, Portland Thorns. Dagny Brynjarsdottir replaces Tobin Heath. Substitution, Houston Dash. Amber Brooks replaces Janine Beckie. Substitution, Portland Thorns. Meleana Shim replaces Lindsey Horan. Attempt missed. Christine Sinclair (Portland Thorns) right footed shot from outside the box misses to the right. Assisted by Lindsey Horan with a headed pass. Goal! Portland Thorns 2, Houston Dash 0. Allie Long (Portland Thorns) left footed shot from the centre of the box to the bottom right corner. Assisted by Tobin Heath with a cross. Offside, Houston Dash. Carli Lloyd tries a through ball, but Andressinha is caught offside. Attempt blocked. Meghan Klingenberg (Portland Thorns) right footed shot from outside the box is blocked. Corner, Portland Thorns. Conceded by Andressinha. Attempt saved. Christine Sinclair (Portland Thorns) right footed shot from the centre of the box is saved in the centre of the goal. Assisted by Tobin Heath. Attempt missed. Amandine Henry (Portland Thorns) right footed shot from outside the box misses to the right. Substitution, Portland Thorns. Hayley Raso replaces Nadia Nadim. Attempt saved. Lindsey Horan (Portland Thorns) right footed shot from outside the box is saved in the bottom left corner. Assisted by Allie Long. Attempt missed. Lindsey Horan (Portland Thorns) left footed shot from the centre of the box is close, but misses to the left. Assisted by Christine Sinclair. Attempt saved. 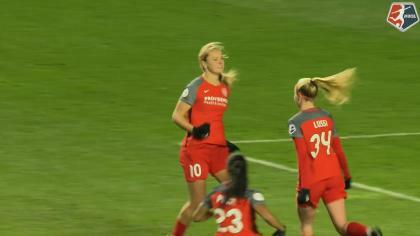 Emily Sonnett (Portland Thorns) header from the centre of the box is saved in the centre of the goal. Assisted by Tobin Heath with a cross. Attempt blocked. Lindsey Horan (Portland Thorns) right footed shot from outside the box is blocked. Assisted by Michelle Betos. Attempt missed. Carli Lloyd (Houston Dash) right footed shot from more than 35 yards is too high from a direct free kick. Attempt missed. Nadia Nadim (Portland Thorns) right footed shot from the right side of the box misses to the right. Assisted by Allie Long. Substitution, Houston Dash. Rachel Daly replaces Denise O'Sullivan. Corner, Portland Thorns. Conceded by Lydia Williams. Attempt saved. 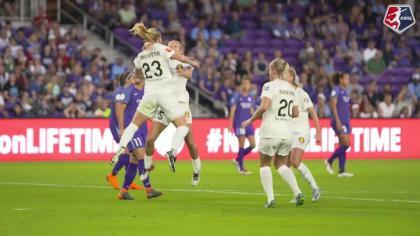 Allie Long (Portland Thorns) right footed shot from a difficult angle on the right is saved in the bottom left corner. Assisted by Christine Sinclair. Christine Sinclair (Portland Thorns) hits the left post with a left footed shot from the centre of the box. Attempt saved. Christine Sinclair (Portland Thorns) right footed shot from the centre of the box is saved in the bottom left corner. Assisted by Allie Long. Goal! Portland Thorns 1, Houston Dash 0. Allie Long (Portland Thorns) header from the centre of the box to the high centre of the goal. Assisted by Tobin Heath following a set piece situation. Offside, Houston Dash. Kealia Ohai tries a through ball, but Carli Lloyd is caught offside. Attempt missed. Carli Lloyd (Houston Dash) right footed shot from outside the box is too high. Attempt saved. Tobin Heath (Portland Thorns) right footed shot from the left side of the box is saved in the centre of the goal. 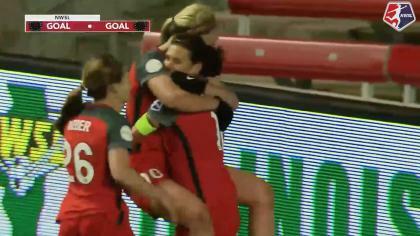 Assisted by Meghan Klingenberg. Attempt missed. Andressinha (Houston Dash) right footed shot from outside the box is too high. Attempt saved. Nadia Nadim (Portland Thorns) right footed shot from the right side of the box is saved in the bottom right corner. Attempt missed. Christine Sinclair (Portland Thorns) header from the centre of the box is close, but misses the top left corner. Assisted by Katherine Reynolds with a cross.